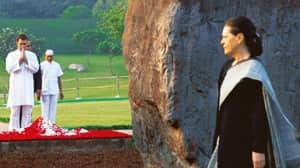 Family value: Rahul and Sonia Gandhi at the Indira Gandhi memorial on her 25th death anniversary on 31 October. For a people reputedly uninterested in our history, we’re lately up to our ears in remembrances. A whole calendric cult of political birth- and death-days has sprung up, and these last weeks have been particularly busy. Today marks 120 years since Jawaharlal Nehru’s birth. 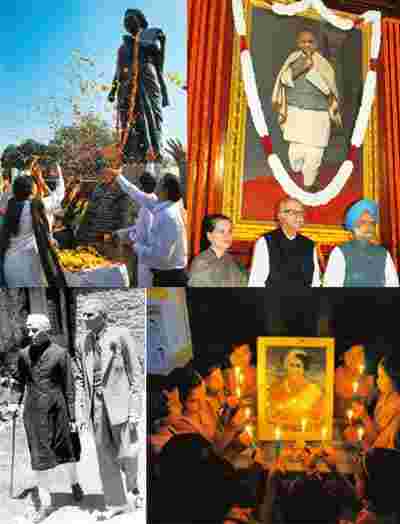 A fortnight ago, Sardar Patel’s birthday bumped into Indira Gandhi’s 25th death anniversary—or, as we are now informed, her “martyrdom". Here in Mumbai, solemn-faced politicians keep shuttling from one commemoration to another, having already spent lakhs to plaster the roadsides with sentimental hoardings and fill the newspapers with full-page reminders of the occasion, as if last season’s leaders were now on deep discount at Vijay Sales. Commemorialism, you might call it. Rampant commemorialism: It’s getting to me. Now, I’m someone who is interested in our past, and in why that past matters to our present and future. So I suppose I should be grateful for any invocation of history, at a moment when young India is giddily insouciant about its progenitors. Chetan Bhagat, purportedly our most popular writer in English, dismisses history and declares an interest solely in the future. Rahul Gandhi, purportedly our coming leader, states that Jinnah—his great-grandfather’s most decisive political sparring partner—doesn’t merit more than a few minutes’ attention. In the face of such determined forgetting, what could possibly be the harm in a few posters and remembrance rituals? At some point between Indira Gandhi’s death anniversary and the birthday of her father, an answer struck me. It had something to do with what was on the Mumbai roadsides, just under the posters: slum dwellers, many thousands of them, more than usually distressed. For weeks now, this city’s poorer citizens have been taking to the streets, not with arms like some of their rural counterparts, but with buckets. They’re searching for water, since supply has been cut by 15-30%, according to official figures, and much more than that, according to the taps they might be lucky enough to share. On one road in the north-west suburbs, positively shellacked with the faces of dead leaders and their aspiring replacements, dry-tap refugees queued hundreds deep at a petrol pump, hoping for a bucketful of a commodity more precious than what the pump usually supplied. It was easier to look at the faces of the departed leaders than the faces in the queue. The great dead, pristine and unthirsty, don’t ask anything of us. But our commemorative fever has other, more significant costs that may be worth thinking about on this anniversary day—and the next dozen we’ll be obliged to nod to. Our parties and governments delight in parading our national icons because it’s a profitable product tie-in: a chance to promote the new-generation politicians angling to be the icons’ modern-day replacements. Perhaps a few of these political aspirants are staying up at night reading history as a guide to present crises. But their parties see history in purely cynical terms: Blur your candidate’s shiny-faced photo into the profiles of the Great Dead. If the eminent departed happen to be in the family, all the better: Either way, promote brand-recognition. Thereby hawk to the citizenry commemorations emptied of historical meaning. Trim once-real and edgy historical actors and thinkers into logos to be sported by those currently in pursuit of office. Proceed to power; recoup your marketing costs. The roadside hoardings and newspaper spreads may be lesser in scale than the statue parks of Lucknow (a Blue Elephant if ever there were one), or the ornate MGR and NTR memorials in the south. But they’re all efforts to use history’s sparkling brand-dust to powder over cracks in our present realities. It’s as if reciting the big old names at anniversaries, or embossing new names on roads, airports and public buildings, might fix us, steady us, in this time of perplexing change. The future is indeed full of uncertainties: about the effects of unequal growth, our regional neighbourhood, Naxals, China, our natural habitat. The problem is that branded history obscures a more relevant and potentially powerful sense of the past. Any surprise that the young are turned off by the historical cartoons they’re constantly shown? Our cut-out Nehrus have dulled their imaginations before they’ve had a chance to see how understanding history—our complex, bumpy history—might illuminate our current and future predicaments. The great figures of our history—those now totemic fossils? Their aim was to spread ideas—outlandish, sometimes radical ideas—in order to change the world. A salt march to rid us of our imperial rulers? Giving the vote to every adult Indian, literate or not, when many other countries around the world were afraid to enfranchise the so-called ignorant? Steering a poor, newly independent country between the ideological sirens of the two superpowers during the Cold War? In doing such things, they created—and left us—a remarkable repertoire of precepts: hard-headed political realism, seriousness in reversing the inequality and injustice our society had perfected, inventiveness in the face of real resource constraints, a confidence not rooted in imitation or flashiness—and remarkable ambition, given the sheer unlikeliness of what they sought to do. Out of the history they made, they created a distinctively Indian way of seeing and acting upon the world. Some of their ideas were failures, some just wrong. Yet still we bristle when people, outside and inside India, point out our contradictions or demystify our heroes. Whether our political founders or the new crop, a decidedly flimsier bunch, we prefer the Amar Chitra Katha version. Think of how much wiser we’d be as a nation if we judged our leaders, rigorously, on the quality of their ideas—and on whether those ideas have lifted the lives of ordinary Indians. One poster campaign I’m waiting to see: a celebration of our history of ambitious, improbable ideas, all more relevant to our tense present and difficult future than the commemorabilia we’re daily being sold.